Eric Wood does not have any MLB stats for the season. 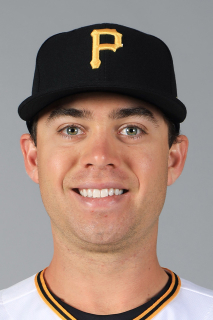 Draft: 2012, Pittsburgh Pirates, 6th rd. Eric Elliott Wilson Wood... Is a 2011 graduate of Pickering High School in Ajax, Ontario, Canada... Hit .318 with 13 doubles, four home runs and 39 RBI in his only season (2012) at Blinn College in Brenham, TX (near Houston)...Was the first Canadian selected in the 2012 Draft and was one of seven Ontario Blue Jays alumni drafted in 2012...Was originally a pitcher with the Ontario amateur team before he participated in an intrasquad home run derby and began crushing home runs; the derby was position players vs. pitchers where after the derby he became a position player...Signed by Pirates scout Trevor Haley. Entered season tabbed by Baseball America as the "Best Power Hitter" in Pittsburgh's minor league system... Attended first big league camp as a non-roster invitee...Hit .167 (2-for-12) in three games while playing for Team Canada in the World Baseball Classic... Spent entire season with Triple-A Indianapolis, where he tied his career high in home runs and also posted a career-best 61 RBI...Finished third among Pirates minor leaguers in home runs and sixth in RBI...Made first career appearance in the outfield while starting in left field on 4/8...Made first career appearance at first base on 4/9...Recorded six extra base hits (four doubles, one triple and one home run) during a five-game stretch from 4/10-14; the first time in his career to have at least one extra base hit in five straight games...Hit safely in a career-high 10 straight games from 6/8-20...Tallied his fourth career four-hit game on 6/28 vs. Durham...Finished the season on a nine-game hitting streak, collecting five multi-hit performances and nine RBI during the stretch...Made 73 appearances at third base, 26 at first base, 11 in left field and eight in right field. April 4, 2019 OF Eric Wood assigned to Indianapolis Indians. March 29, 2019 Pittsburgh Pirates signed free agent OF Eric Wood to a minor league contract. November 2, 2018 RF Eric Wood elected free agency. August 1, 2018 Indianapolis Indians activated RF Eric Wood from the 7-day disabled list. July 16, 2018 Indianapolis Indians placed 1B Eric Wood on the 7-day disabled list. Left hamstring strain. June 27, 2018 Indianapolis Indians activated 1B Eric Wood from the 7-day disabled list. June 25, 2018 Indianapolis Indians sent 3B Eric Wood on a rehab assignment to West Virginia Black Bears. June 6, 2018 Indianapolis Indians placed 1B Eric Wood on the 7-day disabled list. Right pinky fracture. January 22, 2018 Pittsburgh Pirates invited non-roster 3B Eric Wood to spring training. April 5, 2017 1B Eric Wood assigned to Indianapolis Indians from Altoona Curve. January 9, 2017 Pittsburgh Pirates invited non-roster 3B Eric Wood to spring training. November 21, 2016 3B Eric Wood assigned to Gigantes del Cibao. October 8, 2016 Surprise Saguaros placed OF Eric Wood on the reserve list. March 9, 2016 3B Eric Wood assigned to Pittsburgh Pirates. April 6, 2015 3B Eric Wood assigned to Altoona Curve from Bradenton Marauders. March 20, 2015 3B Eric Wood assigned to Pittsburgh Pirates. April 17, 2014 Bradenton Marauders activated 3B Eric Wood from the 7-day disabled list. April 2, 2014 3B Eric Wood assigned to Bradenton Marauders from West Virginia Power. August 29, 2013 West Virginia Power activated 3B Eric Wood. April 2, 2013 3B Eric Wood assigned to West Virginia Power from Jamestown Jammers. March 1, 2013 3B Eric Wood assigned to Pittsburgh Pirates. August 30, 2012 3B Eric Wood assigned to State College Spikes from GCL Pirates. June 14, 2012 3B Eric Wood assigned to GCL Pirates. June 13, 2012 Pittsburgh Pirates signed 3B Eric Wood.